Our district has a large transient population. We have new families coming into our school district daily. 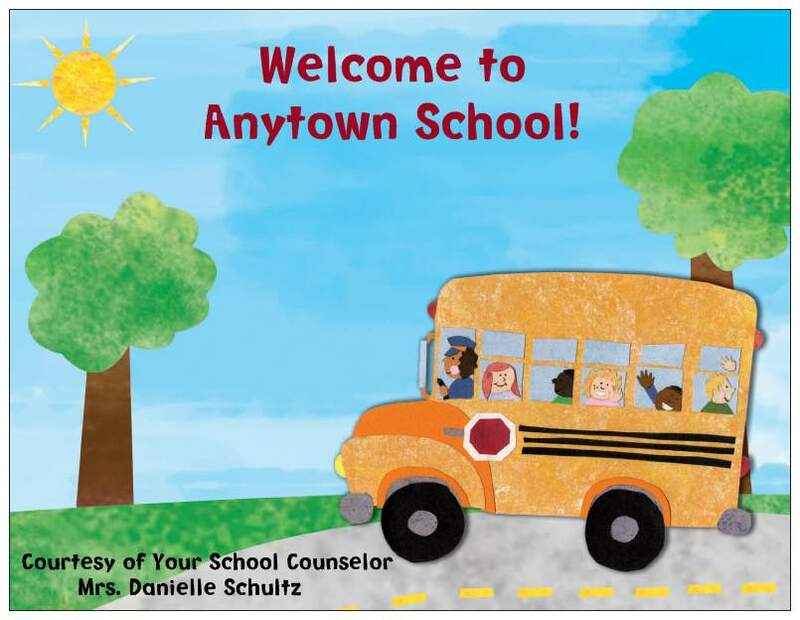 As a school counselor at my school, I have the opportunity to greet new students and welcome them to our school and district. Sometimes students come to our school from another school within the district, but other times the family is relocating and they are unfamiliar with our district. 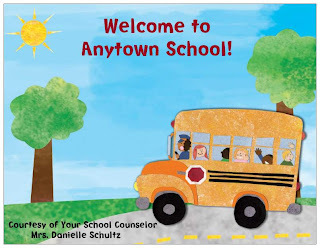 Taking the time to meet with new students and families helps them to feel connected and lets them know that the school counselor is someone they can talk to about questions and concerns. This year I want to be more proactive about making new students feel welcome. I am planning to provide new students with a “welcome packet” including basic materials such as a pencil, notebook, and a school planner. Some students come to their first day of school without any school supplies and some students do not even have a backpack. (I get family members to collect backpacks, tote bags, and drawstring bags to give to students without backpacks). I believe a “welcome packet” would assist new students in being prepared for school and make them excited about their new school. 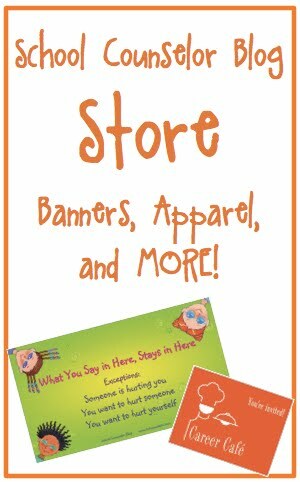 I designed welcome postcards on Vistaprint to include in the "welcome packets." 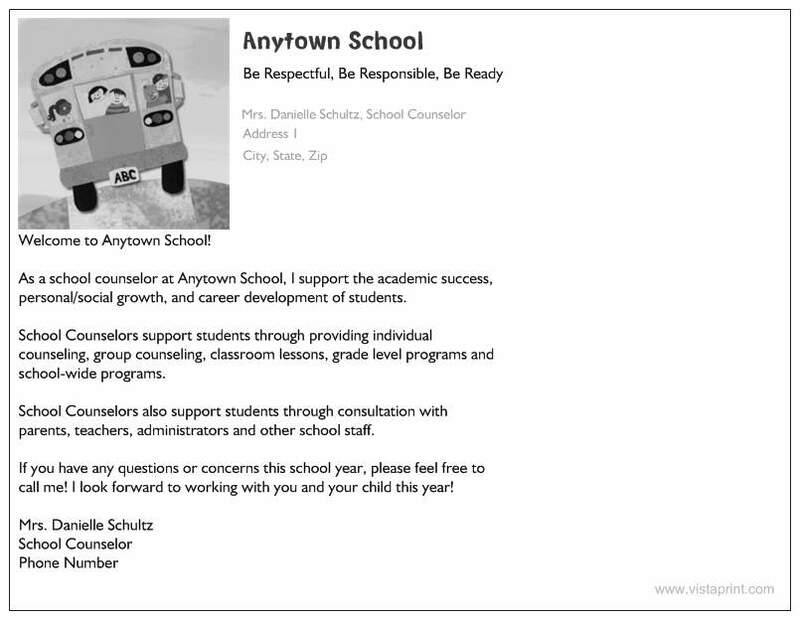 On the back of the welcome postcard, I explain my role as a school counselor and give my contact information. I am hoping to get someone at school to translate the welcome postcard into Spanish so I have welcome postcards for families who speak Spanish. To order FREE Vistaprint postcards like the ones I made, click on the link. The postcards are the fourth item down on the left side. 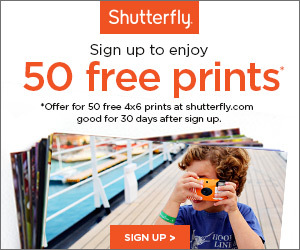 Vistaprint runs specials all the time so keep checking back for great offers. Click here to more creations I made using Vistaprint. A reader asked me to share the pros and cons of my job as a school counselor. Instead of giving pros and cons I would rather share things I love about my job and some challenges. Working with Students. I love that I am able to offer students a place where they feel safe and will be heard. 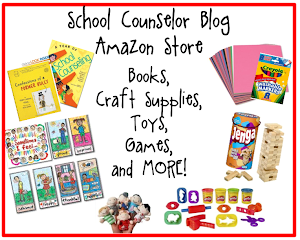 I have a variety of toys, games, and art supplies so students can express their concerns and feelings non-verbally as well as verbally. Facilitating Groups. I love facilitating groups. It is very powerful to watch the group change over time and to see students helping other students. I facilitate groups on a myriad of topics, including anger management, grief/loss, children of incarcerated parents, attendance, character education, and more. Facilitating Classroom Lessons. I love going into the classroom to facilitate lessons. Facilitating classroom lessons allows me to connect with all students. Some students with whom I never met before will come to meet with me after classroom lessons. Being visible in the school makes students more comfortable with coming to see me. Some of my favorite lessons have been: "Rumors and Toothpaste," "With Our Own Two Hands," and "Spaghetti, Marshmallows, and Cooperation." Unpredictability. I love the unpredictability of my day. I wrote about this in blog post called "Plan to be Surprised." The school day is unpredictable and the day may be completely different than you originally planned. Challenges I Face in my Job as a School Counselor. Never Enough Time. One of the challenges I face is feeling like I never have enough time. That is probably the biggest one. As a school counselor, you are asked to wear many hats. I am in leadership positions in the school, I have meetings for the counseling division for the district, I have professional development opportunities I want to attend, and I have my normal roles and responsibilities. Also, the unpredictability I love can also add to the "never enough time" challenge. Some days I have things planned that I need to get done and there is a crisis that I end up working with most of the day (or sometimes the whole day). I either have to stay after school to finish it, come in early, or get it done later than I wanted to. Attendance. At my district, the counselors play a large role in the attendance process. We schedule meetings with families called Truancy Elimination Plan (TEP) meetings. Attendance is a huge issue in our district. This process is very time consuming and it is difficult at times to get the families to come in to school. I am going to try to make this process more proactive this school year. I collected data last year of students with the most days missed and plan on running some groups and doing programs specifically for those students. A lot of the students do not have alarm clocks. My friend and colleague wrote letters to local businesses to get donations of alarm clocks because she was spending so much of her own personal money to buy them for students. I plan to write donation letters also because sometimes the problem of truancy is as simple as the student needing a clock. Scheduling. I enjoy meeting with students about career development and career interests. Scheduling last year was a daunting task because I was new to the building and did not really know the 8th graders before I assisted them with scheduling. I scheduled about 80 students and entered each one into the computer. It was very time consuming. This year, I think the process will go much smoother. I plan to do classroom lessons with the 8th grade before scheduling. I want all of the students to complete a career interest inventory before scheduling as well. I believe that if students have an idea of what they are interested in before scheduling it will help me help them make a correlation between their interests and the classes they want to take in 9th grade. School Counseling is What YOU Make of it. I love my job even the challenges (gasp!). I personally like to feel challenged it is what makes my life interesting. I may not have control over everything, but I do have control over the way I advocate for myself and my program. I have worked a variety of places, but the same theme has rang true for me: School Counseling is What YOU Make of it. Something my dad always says is: "You don't get what you don't ask for." That statement is very true! I think about that statement a lot in my everyday life. (It stifles my complaining about things... well most of the time anyway ;) ). If you want more time to go into the classroom for classroom lessons, ask! If you don't get it the first time, prove it would be beneficial with data. Show what you are doing is making a difference in the lives of children. Who can argue with that? I am not saying it is going to work every time, or that it will happen instantly. My point again (thanks to my dad) is "You don't get what you don't ask for." If no one knows what you do is important or why you want to do it, why would they support it? At the charter school where I worked as a long term substitute, I did not have a space to meet with students individually. 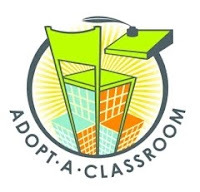 I did however get to go into the classroom more and more because I advocated for myself and my need to connect with students as a school counselor. I asked about having a space for students all the time, but there was no giving in on the administration's part. I was only there for three months before I was offered a full time position at my current job. So, who knows what would have happened if I kept bringing it up and proved why I needed it. What are the things you love about school counseling? What are some of the challenges you face? 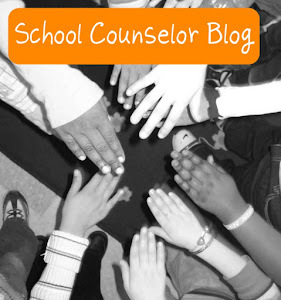 Share your experience below in the comment section or on the School Counselor Blog's Facebook Page. As a school counselor, my office space had some pretty humble beginnings. My career as a school counselor started with my final field internship. I was hired by the school district where I was planning to do my second field internship. I was emergency certified as a school counselor and served as a long term substitute. I was using someone else's space so I didn't feel like I could really make it my own, especially because he was coming back before the end of the school year. The picture to the left shows the little area I used for my resources to work with students. After graduating, I held two different long term substitute positions. During one of my long term substitute positions I did not have a consistent space to meet with kids! I had a desk in between two special education teachers. I enjoyed working with the special education teachers, but I had no space to meet with students that was confidential or consistent. I had to utilize other teachers classrooms, book nooks, conference rooms, the cafeteria, and the nurses office at times to meet with students. I did lots classroom guidance since I did not have a consistent space to meet with students. The picture to the left shows my desk area. Last year, at my current school, I was so excited just to have my own space! My school counseling office was a decent size, but I wanted to be able to meet with groups in my office. One of the teachers generously donated her U-shaped tablet to me. The table took up most of my office, but it was worth it to be able to meet with up to 8 students at a time. (At times I would even have more than that, which is hard to believe). To the left is a picture inside my office from last year. At the end of the school year last year I packed up my whole office because I did not know if I would have a job the following year. My district had a major budget deficit and cut a lot of positions. Thankfully, I still have a job this year! When I went into a meeting for school, my principal told me he was giving me a new space to utilize for my school counseling office for the 2010-2011 school year! It is a small classroom! I was so excited! I really could not believe it considering how at one point I did not even have a space to meet with kids! To the right are are pictures of my new school counseling office area. It is empty right now, but I have some big plans for the space. I can't wait to post new pictures once I get my all my stuff in there. I realized when I was looking at my pictures of my old school counseling office that I have a lot of great resources that I want to share with people. I am a visual person and I thought it would be neat to show readers pictures of my school counseling office and point out the resources. I thought this might also be helpful to new counselors to get some ideas of what to have in their office. I created a Prezi to give readers a "tour" of my school counseling office. There are links within the Prezi so readers could access some great (mostly FREE) resources! All you have to do is click on the links! If you want to see a larger version you can also play it full screen. View My School Counseling Office 2009-2010 Prezi or click below for a tour! I hope you enjoy your tour! Do you have pictures of your office that you want to share with others? Post them on the School Counselor Blog Facebook page! I received a question from a reader about what to focus on in the first year as a school counselor. Q: I see that you're a relatively new school counselor. I graduated in May and I just landed my 1st job in a 6-8 building! I am so, so excited but also very overwhelmed. There are so many things I am planning and trying to organize right now. Do you have any suggestions on what to focus on in the first year? I have a ton of ideas but I feel like it's unrealistic to believe I will be able to implement all of them! A: Trying to figure out what to focus on your first year at a school can be a daunting task. I started my current job in the middle of the school year and it was hard to determine focus then also. When I first started at my current school, I asked the principal what he believed to be the areas that needed the most focus. Based on where he saw the need, I started working with 6th grade on conflict resolution and 8th grade on scheduling and career awareness. After being at the school a few weeks I was able to determine some other areas of need, such as anger management and conflict resolution for other grades, but it was still difficult to maintain a focus. Data is the driving force of a school counseling program. It is difficult to find focus if you don't know where to start. If you do not know where your school is currently, you also won't be able to show the effectiveness of your lessons and programs. During the school year, I attended many conferences and workshops that emphasized the benefits of using data to drive your school counseling program. My district does not currently have a school counseling curriculum, so my goal was to look at the data and base what I was doing on data and ASCA standards. I consulted other counselors and got ideas of how to collect data and how to use data that already exists. If you ask around, you can usually get access to attendance data, discipline referrals, state testing scores, report cards, etc. The American School Counseling Association (ASCA) has resources on the school counseling standards and using data to drive your school counseling program. I would recommend getting the following books if you don't already have them: The ASCA National Model , The ASCA National Model Workbook , and Making Data Work . Another great resource for learning about utilizing data is Dr. Russell Sabella's website SchoolCounselor.com. SchoolCounselor.com has tons of information about what technology you can use to collect and analyze your data. Using data to show where your school is currently and how you are impacting students is crucial. Not only will you be able to show your impact at your school with the data, but you will also be able to show the importance of school counseling in general. The other school counselor and I met yesterday to discuss our plans for the upcoming school year. All of our efforts are going to be aimed at decreasing discipline referrals, increasing attendance, and raising state test scores. We are going to accomplish those goals by continuing to look at the data and focusing all of what we do on those areas. At the end of last year, a team including the principals and myself, created a framework for a School Wide Positive Behavior Intervention and Support (SWPBIS) program as a part of Response to Intervention (RTIi). The whole school will be focused on rewarding positive behavior based on three school rules: Be Respectful, Be Responsible, and Be Ready (the three Rs). We will be defining the rules for each area of the school, including the classroom, the hallway, the bathroom, etc. The other school counselor and I planned out programs and areas of focus for each month based on the three Rs. We also plan to make our classroom lessons aligned to ASCA standards and integrate them into the curriculum. There was a great article, Leveraging Classroom Time by Dr. Erin Mason, in the most recent ASCA magazine about doing just that! Being a first year counselor can be overwhelming. It was hard for me to realize that I can't do everything, especially not my first year. I recommend trying to pick two or three measurable goals for the school year. What is the greatest need in your school? What classroom guidance lessons, groups, or programs can you facilitate to influence change in that area? Once you have determined goals, base your efforts on supporting those goals. Before you start and along the way, collect data so you can show impact. Not everything you do is going to work, but the great thing about data is you wont waste time doing interventions that don't work. You will know when it is not working so you can change it or try something else. I hope this post helps new counselors focus their efforts! Do you have any ideas for helping new counselors find focus? Comment below or email me your ideas!